It was not an everyday request that came to Wärtsilä Schiedam last April. Repairing a screw, without a dry dock, at the other end of the world. When team leader Martin Roest said ‘yes’ to this job, he didn’t know that there would be more obstacles. 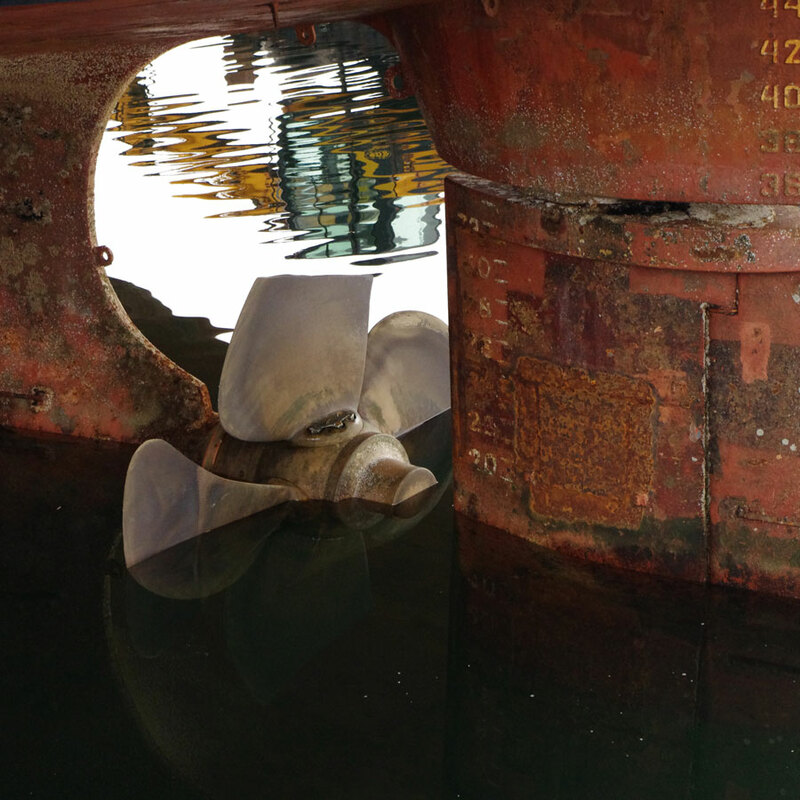 Last April, Wärtsilä Germany contacted the workshop in Schiedam because a propeller blade had (partly) broken off from the MC Scout of Nordica Schifffahrts. Because delivery of a new blade would have taken too long, Germany asked Schiedam to come and repair the propeller. On site. Small detail: that was on the Falkland Islands, at the extreme end of the world, where the weather can be awful and where there is no dry dock available. Extra challenge: the MC Scout sails around 17 to 18 times a year back and forth between Montevideo (Uruguay) and the Falklands. It transports all the freight needed on the islands, and is therefore an indispensable lifeline for the residents. The repair had to be carried out between two trips. Roest decided to take up the challenge. He advised the ship owner to first saw the opposite propeller blade in the same shape as the broken blade so that the vessel could continue to sail in a balanced manner until the Wärtsilä team arrived. That took a while, because a round trip to the Falklands is about twelve days. First, you fly to Santiago de Chile, from where you fly on to the southernmost point of Chile, Punta Arenas. From there you can go once a week to Mount Pleasant, the military airport of the Falklands. You can also only return once a week. So whether your job is done within a day or a week, you have no choice but stay on the islands for seven days. And then back again in two or three days. The team in Schiedam prepared three toolboxes with everything they needed and sent them to Montevideo, so they could be shipped to the Falklands with the MC Scout. Roest: “Shortly after that we heard that the other blades had failed as well. So we packed another four toolboxes and sent them to Santiago de Chile because the ship in Montevideo wouldn't make it anymore. The crates were on the same plane as my colleagues Rob Buwalda, Christ Netten and I. We arrived on the Falklands, but the four toolboxes didn't.” This meant that the crates would arrive with the next flight at the earliest, a week later—on the day the Wärtsilä team were going to fly back.